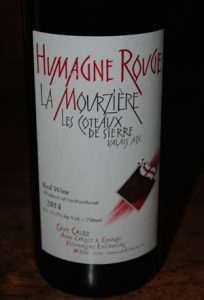 2014 Cave Caloz, Humagne Rouge “La Mourziere” Les Coteaux de Sierre, Valais, Switzerland. The Humagne grape, also known as Conalin d’Aoste in Italy, is a dark red varietal that is very rare and oh so good with a deep garnet/ruby color and full mouth feel it is a thrilling wine, especially in this case made by Conrad Caloz, the king of the mountain, a small organic producer in the Valais AOC of Switzerland. All of the Cave Caloz wines are brilliant and are the result of extreme hard work and passion, and vintage I try of these wines leaves me more and more impressed, imported by Neil Rosenthal, I very much recommend wine lovers take the leap of imagination and try them, in particular the reds, this one is my favorite year after year, but also the extremely rare white Caloz Heida-Paien (Same grape as Savagnin, as found in the Jura) “Les Bernunes” that reminds me a bit of Hermitage Blanc, but with a little less weighty detail. The Caloz 2014 La Mourziere Humagne Rouge starts with a touch of beautiful florals, mineral spice and red tree fruit with a medium full palate of black cherry, loganberry, mulberry and racy plum fruits as well as a gravel/stony quality, alpine herbs, sweet tannin and lively acidity, but with air it fills out, expands and lengthens with tangy currant, white pepper, cedar and fleshy red peach elements unfolding. Like most great wines, it is ever changing in the glass, intriguing and full of pleasure and complexity, this Caloz really is majestic and gorgeous wine, well crafted and wonderfully balanced. It is also a bargain when you consider the exchange rate with the Swiss Franc and the sublime nature (or soul) of this wine and when you compare what you get for fifty dollars from other regions! Conrad and wife Anne-Carole farm by hand steep terraces in the dramatic and rocky landscape in the high elevation Coteaux de Sierre, an area steeped in history and prized by the Romans, the Dukes of Burgundy and the House of Savoy for the mountain wines made here, famous also for the near by Matterhorn, and set between the source of the Rhone River and the cool waters of Lake Geneva, this is a special terroir and these Caloz are special wines!